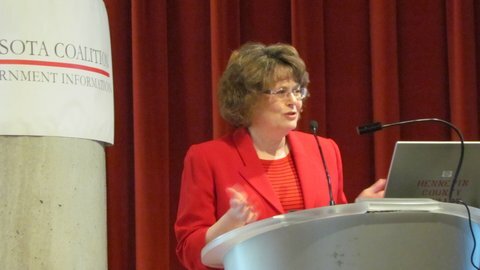 The Minnesota Supreme Court will consider expanding a pilot program to allow audio and video coverage of criminal court proceedings after a guilty plea or verdict is entered. This follows a two-year pilot that allowed cameras at civil court proceedings. 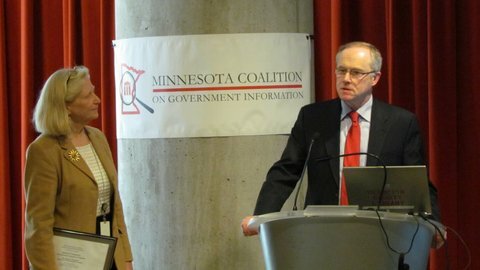 The Minnesota Coalition on Government Information (MNCOGI) commends the Minnesota Supreme Court for continuing to move forward in allowing Minnesotans to see their court system in action. The coalition commends the Court for its extensive efforts and hard work in striving to provide open access to judicial proceedings as we transition to the electronic age. The U.S. Supreme Court, in a 1947 decision (Craig v. Harney, 331 U.S. 367, 374), said: “A trial is a public event. What transpires in the courtroom is public property.” In 1981, in Chandler v. Florida (449 U.S. 560), the Court ruled that states could experiment with television coverage of criminal trials. The Court found that state experimentation with “evolving technology” in the courtroom, as long as it does not infringe on “fundamental guarantees” of the accused, is consistent with the Constitution. The public has a right to observe proceedings in open court. “To work effectively, it is important that the society’s criminal process satisfy the appearance of justice, and the appearance of justice can best be provided by allowing people to observe it.” Richmond Newspapers, Inc., v. Virginia, 448 U.S. at 571-572 (1980). MNCOGI commends the Advisory Committee on Rules of Criminal Procedure for proposing a pilot program to allow cameras in “criminal proceeding[s] occurring after a guilty plea has been tendered or a guilty verdict has been reached.” Rule 4.02(d). We are pleased by the recommendation that “Absent good cause, the trial judge must grant a media request for audio and video coverage of proceedings governed by the pilot,” by the presumption favoring coverage, and by the recommendation that the pilot should be carried out statewide. MNCOGI is appreciative of the Advisory Committee’s commitment to further open criminal proceedings to video and audio coverage, and our organization looks forward to additional steps in this area. After more than 10 years of consideration, we believe no problems will arise. Adequate safeguards are in place to protect the participants in the process and the decorum of the court. Problems that have been anticipated have not materialized. We believe that will continue to be the case. In the State of Ohio, for instance, video is now the official record. The cameras are positioned all over the courtroom, except toward the jury box, and microphones are everywhere but the spectator area. DVDs are the public record, available for $2.25, and can hold a day-long hearing. The judges say that the fears that people would “play to the camera” have not come to pass. The cameras are so ubiquitous as to be almost invisible. Everyone knows they are there and no one thinks about them. 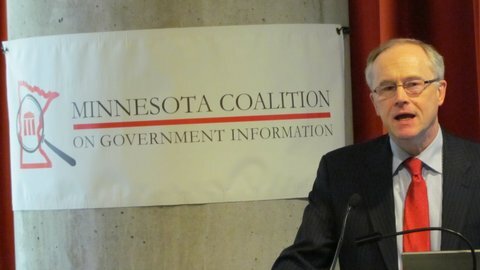 The Minnesota Coalition on Government Information believes that a similar outcome will ensue in this state. Further opening Minnesota courts to audio and video coverage will foster community understanding and present citizens with a positive experience of what goes on in their courtrooms. MNCOGI and board member Don Gemberling have been featured in recent Minnesota news coverage. On November 11th, Minnpost ran a piece on data privacy issues, and Don Gemberling made an appearance in a recent Almanac broadcast about lawsuits stemming from drivers license data breaches. After two years of limited camera access to Minnesota district courtrooms, the Supreme Court is set to decide whether to extend, expand or halt the practice of giving greater public access to the judicial process. This week, the Court’s General Rules Committee will issue a recommendation to reflect the views expressed during their meeting Sept. 20th. This same committee in 2011 voted 16 to 3 against the current pilot project. The Supreme Court justices ultimately rejected that recommendation. At Friday’s meeting, attorney Mark Anfinson asked for an extension of the current experimental project to allow video and still cameras in courtrooms during civil cases at the judge’s discretion. He also suggested expanding the test to allow cameras during criminal court cases. He cited some two dozen examples of media requests for camera access during the test period with no negative issues arising either from judges or media organizations. 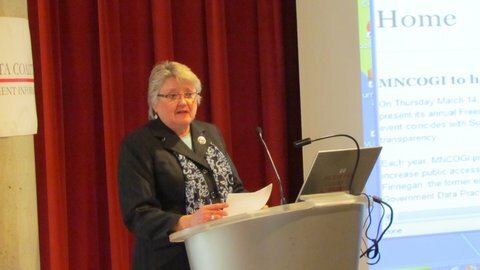 WCCO producer Joan Gilbertson presented samples of her organization’s coverage of civil cases. The members of the committee praised the coverage, but their conclusions of the pilot are mixed. Hon. 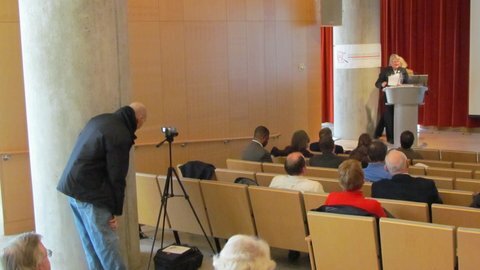 Robert Walker, a one-time opponent of allowing cameras in courtrooms, expressed his wish to not let momentum for the current project die. He suggests allowing cameras in additional ‘safe and appropriate’ settings such as the state’s drug and veterans courtrooms. The Hon. Mel Dickstein said the examples of courtroom coverage presented at the meeting were ‘quite good’. Still, he sees the recent pilot as a ‘lost opportunity’ for the media to tell more stories that arose from civil courtrooms. He said he’s unconvinced that the pilot produced enough compelling evidence that the practice of allowing cameras should continue, much less expand to criminal proceedings. MNCOGI Chair Helen Burke and John R. Finnegan Jr.
John R. Finnegan Jr. presents the John R. Finnegan Freedom of Information Award to Michele Timmons. 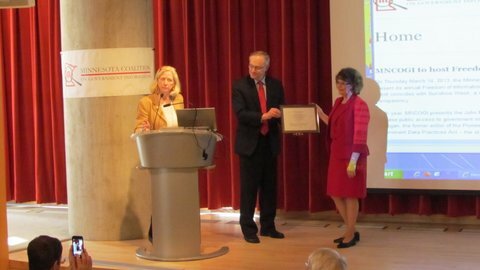 Michele Timmons accepts the John R. Finnegan Freedom of Information Award. Rich Neumeister, recipient of the 2009 John R. Finnegan Freedom of Information Award, will be interviewed on this week’s Almanac: At the Capitol, with Mary Lahammer. Air times are Wednesday, March 25 at 10:00 p.m. and Thursday, March 26, at 4:00 a.m. on Channel 2. Channel 17 will air the program on Wednesday at 7:00 p.m., Thursday at 2:00 a.m, 7:00 a.m. and 2:00 a.m.
Robbie LaFleur, Director of the Minnesota Legislative Reference Library, has been named recipient of the 2008 Peter S. Popovich Award. The Popovich Award is given each year by the Minnesota Professional Chapter of the Society of Professional Journalists to “the person or organization that exemplifies the fight for First Amendment Rights.” SPJ will present the award at the 2008 Page One Awards Banquet on Thursday, June 12, at the Town & Country Club in St. Paul. The award was named for the late Peter S. Popovich, a champion of open government during his years in the Minnesota House of Representatives, as the chief judge of the Minnesota Court of Appeals and as the chief justice of the Minnesota Supreme Court. 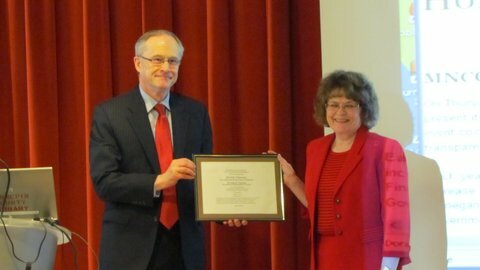 LaFleur and staff of the LRL have been honored with numerous awards and citations for excellence in the provision of access to government information.